The following short story was written for the professional writing unit of BA Communication and Media at Bournemouth University. The story is a snippet of childhood in rural Scotland in the sixties. Wee Malcolm was busy, very busy in his own wee world. He was far too busy to be interrupted with mundane tasks. The dry crumbly earth that lived south of the greenhouse needed to be transported up the long path past the coal shed to the left a bit of the gigantic rhubarb patch. Normally this task would fall into the category of mundane, but not today. Today wee Malcolm has borrowed John Robertson’s tractor and bogey. This important work cannot be interrupted to go for messages with Granny. When John Robertson notices that his tractor and bogey are not parked by his mum’s bin shed it is highly probable that this important work will have to cease. Madge Easson buttoned the top button of her coat that concealed her fading floral pinny, adjusted the knot of her headscarf that concealed eight sponge rollers and swung her shopping basket across her forearm. Her wrinkled stockings were failing miserably to conceal her corned beef legs, an age-old Scottish ailment caused by sitting far too close to a roaring coal fire. She gently pulled the front door shut as her five-year-old grandson trundled down the side path of twenty-four Belmont Terrace on a noisy plastic tractor. The decaying and overgrown garden served as a constant reminder to her that she was a widow. Her husband Malcolm’s green fingers had been the envy of many in the village of Kinpurnie. Number twenty-four had once been a kaleidoscope of colour. April would see the vibrant blue of the forget-me-nots mingle with purple and yellow pansies and tall majestic hyacyinths perched on their twelve-inch stems. As she walked down the front path a solitary cerise petunia was struggling for survival within a mesh of strangling weeds. “ Behave yersel now and remember I’ve got eyes in the back of my heid,” was the message that entered through wee Malcolm’s left lug and exited through his right one. With one last check that her sparse purse was in the shopping basket, Madge trundled off to Pirie’s greengrocery with the customary request for a bag of sweeties still fresh in her own ears. After an additional two bogey loads of earth wee Malcolm’s busy wee world was interrupted by a noise. A new noise, a clippity cloppity noise that was unfamiliar to his five-year old senses. He crouched low, behind the overgrown hedgerow that towered above his Granny’s front borders and peered through the dense green privets in wide-eyed amazement. It was as tall as the hedge; his mind raced to recollect the image before him, he had seen a picture somewhere … it was a horse! Wee Malcolm had no idea why there was a grey speckled horse stopping in Belmont Terrace, near Betty Robertson’s house, but he knew this one must be very special with a bogey as big as a bed behind him and with multicoloured windmills and balloons of every colour. Wee Malcolm ran as fast as his brown scuffed sandals would carry him in the direction of this wondrous spectacle. Within seconds he was craning his neck upwards to introduce himself. As wee Malcolm looked downwards at a pair of hooves he was also greeted with a big pair of working boots, just like the ones his dad wore, except on one toe there was a large hole where a shiny bit of steel shone through. Wee Malcolm continued his uninvited inspection back upwards revealing a long hairy coat held together with a piece of old rope and an auld bonnet, which partially hid a brownish leathery face. “ Is it ok tae stroke him mister? Whit’s he’s name?” A fascinated Malcolm asked, waiting impatiently for a response. There was a pause as wee Malcolm stroked the horse’s leg. The harsh texture startled Malcolm to begin with; it felt like the jaggy sacks that lived in the coal shed.The man grunted in a gravelly voice through a toothless grin “Billy… I call him Billy”. Malcolm smiled one of those apprehensive smiles, the nervous kind of smile that always ends in a giggle. The man crouched down and whispered quietly in Malcolm’s ear. Suddenly wee Malcolm’s scuffed sandals were galloping back up towards his Granny’s front door. Fifty seconds later he re-emerged through the wide open door, he was a warm reddish bundle with a pair of dirty knees sticking out of the bottom, his grubby wee hands grappling to control his chaotic currency as he skipped back down a curtain twitching Belmont Terrace. As balloons go there was nothing spectacular about the one now sitting in John Robertson’s plastic bogey. Malcolm’s important excavation work would no doubt continue tomorrow, but for now he had to transport his prized possession just like Billy. He was clippity clopping up and down the side path as his Dad’s work boots clumped up the front path. The ritual “Hello bugger lugs” was met with little response from wee Malcolm’s gob-stopper filled mouth. 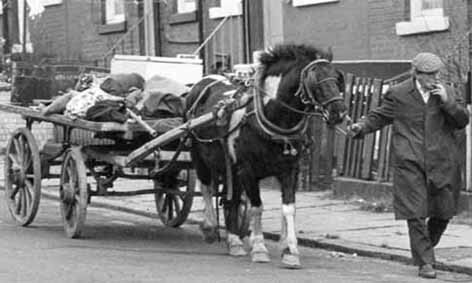 Times had been hard for Max Easson after losing his wife Jean, but things were on the up. Thanks to the fifty-bob tailor’s generous payment scheme he was going to look the perfect man for his date with Mary Hunter. As he scraped the last piece of shaving soap from his chin he sang “ John Collier, John Collier the window to watch”. The two-button closure jacket with double button cuffs and single back vent, the tapered trousers with a stylish flat front. Everything would be perfect. The tailor had assured him that the slightly wider lapels were the most fashionable option for the approaching nineteen seventies. In warm reddish one hundred percent wool with a subtle green plaid effect it was difficult to imagine Mary Hunter being anything other than impressed. As he generously splashed the Old Spice in his bedroom his mother shouted through “ The rag and bone man was in the village today”. At that moment he slid open the wardrobe door to an empty coat hanger.